5 Stars / Christie, Agatha / Hound of Death, The / Last Seance, The / Short Stories / Tuesday Terror! First published in 1933, when spiritualism was still at its height, the story is based on an acceptance that Simone’s powers are genuine, including her ability to generate ectoplasm; and Christie is skilful enough to make even this cynic go along with the premise. The ending is horrific and terrifying but told without any graphic detail – indeed, as with the best horror, most of what the reader sees is what her own mind creates. A great story, from a great collection – it didn’t scare me quite as much as when I first read it…but then I knew what was going to happen. Do you?? 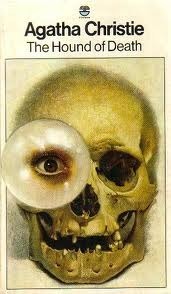 agatha christie, book review, horror, medium, spiritualism, the hound of death, the last seance, tuesday terror! She’s very good at short stories. It’s not my favourite format but Christie shows that it can work when it’s done well. Short stories used to not be my favorite format, but it is really growing on me, because it’s such a challenge to write, to make every word count. Indeed! And when they are written well, they can be great. But so often they read like a fragment of something bigger. However, this Tuesday Terror thing is forcing me to read more of them and you can really tell which writers have mastered the form – Christie being one. I agree! You’re right I am definitely guilty of doing that with my Friday Fictioneers stories – almost of all of them read like glimpses into a bigger story – a scene if you will. I will have to read some of her short stories soon to see what I can learn. Seriously though, I find your scenes very interesting (and well written) and often find myself wishing they were longer. FictionFan – Oh, that is a good ‘un! The first time I read it, I definitely felt that prickly feeling. And even knowing how it all ends, I still get drawn in. And I think you’ve put your finger on exactly what works: Christie manipulates the reader into believing the story. A terrific choice!! I have bought the Christie to help me through another attention demanding factual tome I’m reading. However, the Amazon page is weird and heavily doo doo doo doo as half the reviews are for a completely different book. Ectoplasmic authors from beyond??????? Well, I really didn’t think this was your kind of thing at all! But I hope you enjoy it…and don’t get too scared! The Jackson is really wonderful, isn’t it? And unlike the Christie, I really thought it would be just your kind of thing. I look forward to your review – LitBeetle’s started a little craze for that one. The professor has never heard of this Christie book. I’m definitely interested. I do hope it’s better than SK’s horror. Believe it or not, I think the professor is actually going to search for this one. A great review, and I already like Christie, so it should be highly entertaining, I think. I didn’t know you were a cynic, FEF. Really I didn’t. See? See what you’ve done? You said most of what the professor sees is what “her” mind creates. Very unsatisfactory, sir! Oh. yes, very cynical – specially when it comes to ghosties and ghoulies. Well, it’s not my fault the silly English language doesn’t have gender-neutral words! But the Professor has my permission to see the horror in his mind…OK, ma’am? What? FEF doesn’t believe in ghosts after knowing Bob? Goodness. I was skeptical at first too. It doesn’t need them, you see. The professor thinks you got it wrong. Unless, of course, you were speaking about a ship. Ma’am? Hmm…I really hoped you were over that. Really I did. Yes, it’s my aim to convert the Professor to the joys of the tottering, heaving TBR – so much fun! Very true – though Aggie always looks so sweet it’s almost scary. Oh, I believe in cat-evilness, but if Tuppence was a ghost surely she wouldn’t each so much? Hmm…it probably won’t happen, since the professor burns books that annoy him. Now, the professor will think of Tuppence as a glutton, I fear. I’m quite cranky all the sudden. Tuppence has a healthy appetite, there’s no denying it. But she works it off fighting with the neighbourhood cats. Are you calling the professor cryptic? I think I like the sound of that, but it does make the professor seem like a mummy in tomb or something like that. Anyway, the professor wasn’t upset at all; I’m just being beastly, I suppose. Oh good! I was worried you might change your mind about the bookshelves – I shall enjoy poking around them! Well, tomorrow’s is also coupled with a bit more about the professor, so it should be a complete dadblamery. 😀 Very glad you feel that way. Maybe I was just being professorish then. I was really hoping to clear that up. Oh well. Great review and very true as far as, ‘most of what the reader sees is what (his or)her own mind creates.’ It is a statement that today’s film-makers should heed. Regarding, Agatha Christie, her known racist and anti semetic views stop me from reading her. Indeed! I’ve never found graphic horrors nearly as scary as subltle hints that leave most of the work to the imagination – hence why Hitchcok is the master. I must admit I tend to make allowances for writers of previous generations so long as the books themselves aren’t too offensive. They’re the product of their times, I think. I feel differently about current writers, but so many of the classics would have to go if their attitudes were judged by today’s standards. But where does one draw the line. Which date is the cut off for ignoring racism and anti semetic views used by writers? She was alive into the 1970s. She was fully aware of the horrors of the concentration camps during WW2 but this didn’t change her anti-semetic views. Oh yes, you really must – or the cats will be so offended…! Thanks for the name check! I won’t be rereading this – largely because every word of it is seared into what passes for my brain. Great review. I hope those who are brave enough can find the book. Incidentally’ the cover you illustrate isn’t the one I remember – mine was taken from the title story – another one not to read when alone in the dark…….. The cover is by Tom Adams – they were all reprinted just as I started my first job, all with covers by him and I collected pretty much the whole set over the next couple of years. I love the covers – he always shows a few of the most important points but in a quirky way that doesn’t give the game away. One of that rare breed – cover artists who actually read the book… Of course, they’re all falling apart now. Can I suggest a couple of books for your Tuesday Terror posts? One is The Judas Child by Carol O’Connell – the scariest book I’ve ever read. The second, more thriller than horror, but the scariest books I’ve read in a long time: After The Darkness by Honey Brown.